REC AE-US Series PV modulesThe REC AE-US Series modules, made in Sweden by REC, are a series of high quality solar modules designed to meet system demand for exceptional performance. 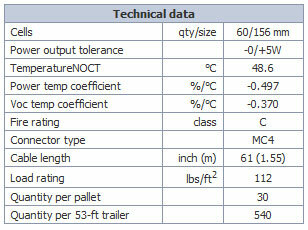 Quality and PerformanceRigorous quality control is applied throughout the production process, from cells to modules. Sixty 156 mm square multicrystalline solar cells in each module are optimized for low light conditions and increased light absorption. The modules have an innovative design that reduces shading effects in order to achieve maximum performance. A power output tolerance of -0/+5W guarantees minimum mismatch losses. InstallationREC AE-US Series allows for quick and easy installation. The modules are equipped with PV Wire cables with MC4 locking connectors for problem-free inter-module connection. Cables meet 2008 NEC requirements for use with transformerless inverters. Environmental PracticesThe REC AE-US Series generates environmentally sound electricity. Cell and module production processes are designed to maximize recycling and reduce environmental impact. REC’s wafers, cells and modules are produced within Scandinavia and the company’s activities are therefore subject to very high standards of regulation regarding environmental standards. Warranty The REC AE-US Series comes with a 63-month workmanship warranty and a guarantee of 90% of rated power output for 10 years, and 80% of rated power output for 25 years. PE-US Series PV modulesThe REC PE-US Series modules, made by REC in Singapore, are a series of high quality solar modules designed to meet system demand for exceptional performance. Rigorous quality control is applied throughout the production process, from cells to modules. 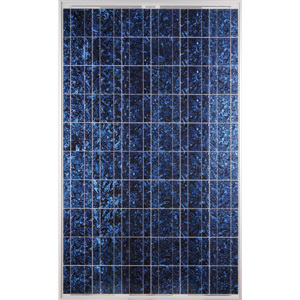 Sixty acid-etched, 3-busbar, 156 mm square multicrystalline solar cells laminated behind high-transparency glass with an anti-reflective surface treatment give these modules an efficiency of up to 14.2%. A power output tolerance of -0/+5W guarantees you the power you pay for and minimum mismatch losses. The REC PE-US Series modules are made with silicon refined in the U.S. using renewable energy. Their energy payback is under one year and their cell and module production processes are designed to maximize recycling and reduce environmental impact. 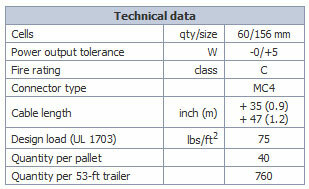 InstallationThe comparatively low weight (39.6 lbs/18 kg) of the REC PE-US Series allows for quick and easy installation. The modules are equipped with an environmentally sealed junction box and PV Wire cables with MC4 locking connectors for problem-free inter-module connection. Cables meet 2008 NEC requirements for use with transformerless inverters. Warranty The REC PE-US Series modules come with a 63-month workmanship warranty and a guarantee of 90% of rated power output for 10 years, and 80% of rated power output for 25 years.